Herbert Hand commemorated at Loos Memorial. Horace Hand commemorated at Pozieres Memorial. In his military papers, Joseph Hand gave Bottesford as his place of origin, and this was repeated in the database Leicestershire & Rutland Soldiers Who Died 1914-1920, where it was noted by local genealogist Trevor Lewis and passed to the Bottesford project by Sheila Marriott, the genealogist who has assembled compendious records of the community of Barkestone-le-Vale and the surrounding area. Sheila has also provided detail of Joseph’s family, for which we are extremely grateful not least because it has made it possible to understand Joseph’s family circumstances. Joseph’s relationship with Bottesford is difficult to establish. He was born in nearby Barkestone-le-Vale, and later lived in Nottingham. He may have spent a small part of his childhood in Bottesford, but even this has not been substantiated. He may have lived in Bottesford between 1911 and his date of enlistment. He was ‘Killed in Action’ on the 23rd of October, 1917, in the Second Battle of Paschendaele, and is commemorated at Hooge Crater Cemetery, and also at St Remigius parish church, Long Clawson, Leicestershire. He is one of a small set of men who lost their lives in WW1 and who gave Bottesford as their place of origin, yet are not named on Bottesford War Memorial. Joseph Hand was part of a large family which played a proud part in British military history. This page also remembers his brothers Henry, Herbert, Ernest, Arthur and Horace. In particular, Herbert and Horace Hand. both of whom lost their lives in WW1. The words in his war grave record (CWGC) state that he died in October 1917, aged 21, therefore he was born in 1896 or 1895. 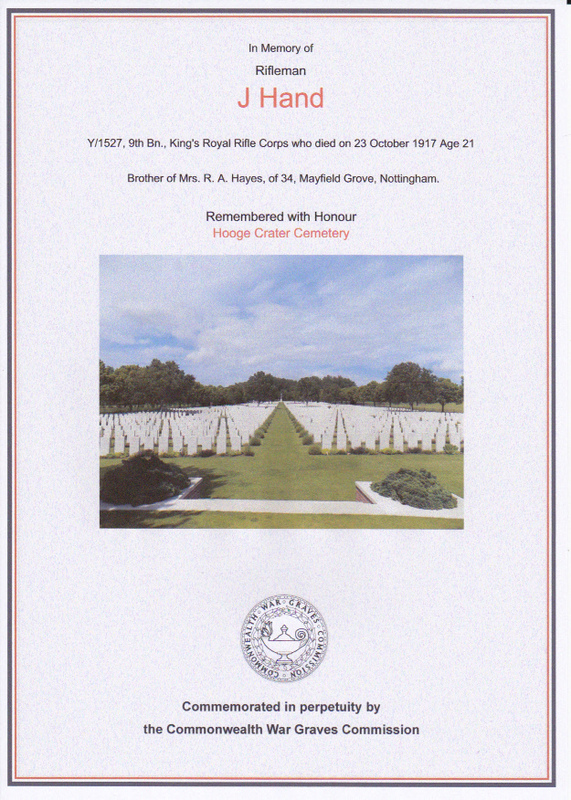 They also state that he was a brother of Mrs R.A. Hayes of 34 Mayfield Grove, Nottingham. In the Census of 1911, Mrs Rose Annie Hayes was the 38 years old wife of David Hayes, therefore born in 1872 or 1873. In the Hayes household lived her brother Joseph Hand, aged 14 (born 1896). Barkestone parish records indicate that Rose Ann Hand was the oldest child of Joseph Hand (senior) and Alice (neé Cross). Rose’s father Joseph Hand was a farm worker born in Barkestone on the 5th March, 1848. Her mother was born in Long Clawson in 1849. They married in 1868. Rose Ann was their first child, born in 1869 at Long Clawson, followed by Henry (1876, born at Grantham), Herbert (1878, born at Bottesford), Grace (1881, born at Bottesford, died that same year), Gertrude (1882, born at Bottesford), Ernest (1888, born at Barkestone), Arthur (1889, born at Barkestone), Mabel (1892, born at Barkestone, died same year) and finally Joseph (born 4th December 1895 and baptised 8th January 1896, at Barkestone). Rose Ann was born some 26 years before her brother Joseph. Alice Hand died in December, 1895, during or soon after the birth of her last child, named Joseph who was baptised in January 1896 at Barkestone. In September, 1896, Joseph Hand (senior) married a second time, to Sarah Alice Scarborough (born 1856 at Long Clawson), and they had a son named Horace Hand, born in 1897 at Long Clawson. 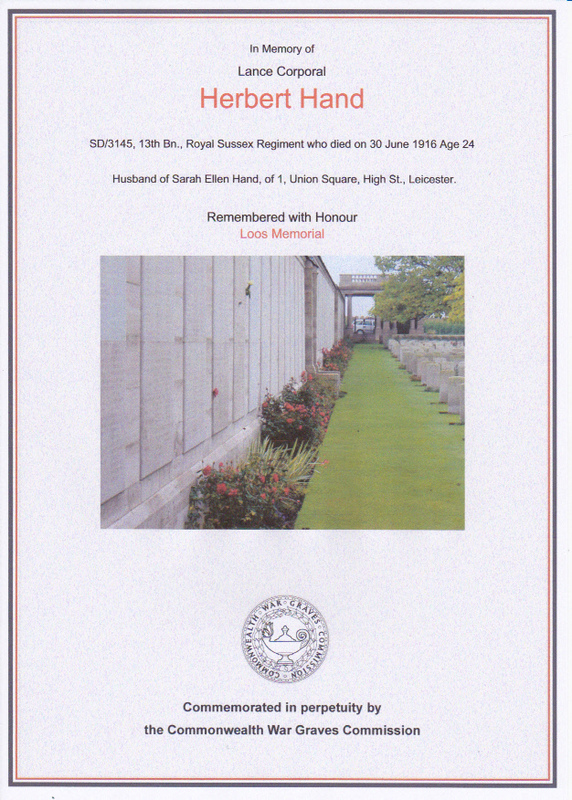 Horace Hand went on to serve as 39664 Private, 8th Leicestershire Regiment, and was Killed in Action on the 21st of March, 1918, in France. Rose Ann Hand married David Hayes in December 1896 in Nottingham. He was born at Stathern in 1867. Their children were David Sadler Hayes (born 1897, in Radford), Alice Mabel Hayes (born 1900, in Nottingham), Edgar Hayes (born 1901, in Nottingham) and Harris John Hayes (born 1905, in Nottingham). However, Rose also had a daughter, Ethel Brown Hand, born on the 3rd September, 1889 at Barkestone, seven years before she married. The identity of Ethel’s father is not certain, though he might have been named Brown. The parish records add that Rose also had a son named Joseph Hand, born in 1896. There is very little recorded about him. Presumably he, like Ethel, was illegitimate, and was born less than a year before Rose married David Hayes, who might have been his father, but this is not certain. It may be thought a strange coincidence that both Rose’s brother Joseph and her son Joseph were born within a year of each other. In 1901, Joseph Hand senior (now an ironstone quarryman) and Sarah lived on Melton Road, Long Clawson, and with them were Ernest Hand and Arthur Hand, children from the first marriage, and also Horace Hand, but not Ethel or Joseph Hand. In April 1891, one year old Ethel was being looked after by William and Walton Hannah (neé Cross, Ethel’s great-aunt), at Nether Broughton, Leicestershire. In April 1901, Ethel, now 11, was with her mother and her husband at Clayton Cottages, 1 Clayton Street, Nottingham, along with Rose and David’s children David Sadler (born 1898, aged 3) and Alice Mabel, plus four years old Joseph Hand Hayes (aged 5) and Herbert Hand. The Hand and Hayes families were clearly close to each other. Joseph was described in this census as the ‘son’, which may mean that he was the son of Rose and David but born before they married. In the 1911 census, the family was at 9, Buxton St., Nottingham. Here were David Hayes, 44, a Midland Railway Porter born Stathern, his wife Rose Annie Hayes, and children Ethel Brown Hand (21, working as a servant), David Sadler Hayes (born 1892, aged 19, an errand boy), Alice Mabel Hayes (11), Edgar Hayes (10), Harris John Hayes (6), Joseph Hand (14, “brother”, at work as a moulding ‘learning’) and Herbert Hand (32, a boarder at work as a coal hewer). This agrees with the military records which state “Brother of Mrs R.A. Hayes”, although in the 1901 Census Joseph had been described as Rose’s son. There is a discrepancy regarding the age of David Sadler Hayes, recorded as born 1898 in the 1901 census, but born 1892 in the 1911 census. However, records from the General Register indicate that he was born in 1897, so that the ‘1892’ entry in the 1911 census must be an error. 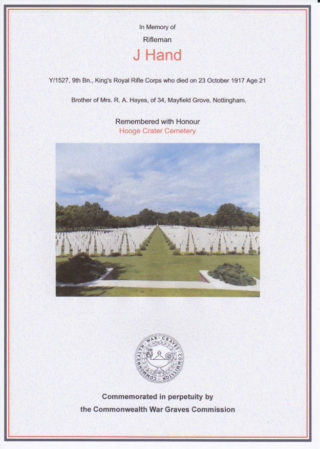 The Force War Records website has the record of Joseph Hand, Y/1527 Rifleman, 9th Btn Kings Royal Rifle Corps, fought in ‘France and Flanders’, KIA 23/10/1917, awarded Victory Medal and British War Medal, brother of Mrs R A Hayes 34, Mayfield Grove, Nottingham. 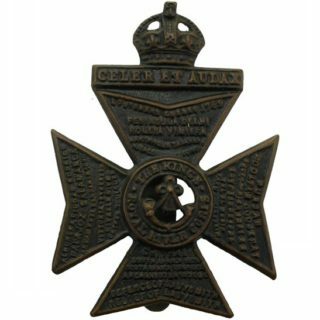 The 9th KRRC was formed in 1914 as part of Kitchener’s First New Army, and became part of the 42nd Brigade, 14th (Light) Division, which took part in the battles of Paschendaele during the autumn of 1917. 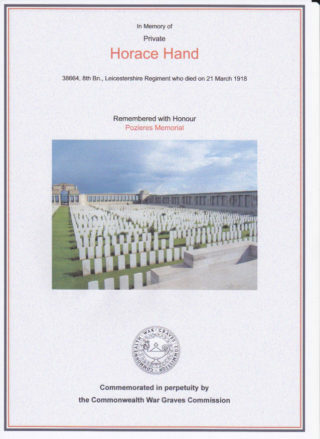 The record in the “Leicestershire & Rutland Soldiers Died 1914-1920” database created by Peter and Michael Doyle, the record is: Joseph Hand, Bottesford, Leics, Y/1527, Rifleman, 9th Battalion, King’s Royal Rifle Corps, died 23/10/1917, commemorated at Hooge Crater Cemetery, Zillebeke, Belgium, and at St Remigius, Long Clawson. The Commonwealth War Graves Commission records confirm these details. The Hand family had a proud record of military service. Joseph’s oldest brother, Henry (Harry) Hand born in 1875 attested at Derby of the 8th March 1893, having worked as a groom and already been in the 4th Sherwood Foresters. In 1893 he became Driver 2/11153 Army Service Corps, and served until 1896. He was recalled “under Special Army Order” in October 1899 and took part in the South Africa campaign, receiving the South Africa Medal. He was finally discharged in 1905, having been in the army for 12 years. He married Frances Ellen Ingleton in 1899, and died in 1940 at Long Clawson. Joseph’s second oldest brother, Herbert Hand, born 1878, was killed on the last day of June, 1916, in the first action of the Battle of the Somme. He married Sarah Ellen Moore in 1914, in the Melton area. He enlisted as SD/3145 Private 13th Battalion, Royal Sussex Regiment, and was Killed in Action on the 30th June, 1916. He is commemorated at Loos Memorial. He was recorded as the husband of Sarah Ellen Hand of 1, Union Square, High St., Leicester. The 13th Royal Sussex was part of Kitchener’s New Army, and joined the 116th Brigade of the 39th Division. The Long Long Trail website comments: “The pals battalions of the Royal Sussex – the South Down battalions, or “Lowther’s Lambs”, – suffered terrible casualties on 30 June 1916, 24 hours before the much better known “First Day on the Somme”. This was in a diversionary attack, a large scale raid launched by 39th Division at a position called the Boar’s Head, near Richebourg l’Avoue. Just under 1,100 casualties (dead, wounded and prisoners) were incurred in a fruitless attack that had no effect on the enemy’s abilities to withstand next day’s assault on the Somme. The vast majority of the losses were to men from the county of Sussex”. Ernest Hand, born 1888, married Kate Reddish in 1912 and died in the Grantham area in 1966. H attested on the 13th January 1906, aged 18. At that time he was a farm labourer working for his brother-in-law David Hayes, and living at 5 Berlin Terrace, Bunbury Street, Nottingham. He became 1155 Private 4th Sherwood Foresters, and was sent for musketry training. However, on the 1st August 1906 he was transferred to the Royal Navy at Portsmouth, as an Ordinary Seaman, and went on to become Able Bodied Seaman on the 28th August 1909 and complete his service on the 6th January 1910. He served on a succession of pre-Dreadnought battleships in home waters and the Mediterranean: HMS Barfleur, a Centurion Class battleship launched in 1892, flagship of the home fleet, then HMS Prince George, HMS Duncan, and HMS Swiftsure (information from Wikipedia). However, he played no active part in WW1. There appear to be few records of Arthur Hand, born 1889. A man with this name was married in 1922 to Elsie A. Cross, and died in 1961. However, the “Leicestershire & Rutland Soldiers Died 1914-1920” database has two records, one for ‘A.Hand’, killed during the war and commemorated at St Peter & St Paul, Barkestone, the other for ‘W.A.Hands’, also commemorated in the same parish church. No other details of these unfortunate men have been located, and it is not clear if either was Joseph Hand’s brother. Horace Hand, Joseph’s younger half-brother born in 1897 at Long Clawson, served as 39664 Private, 8th Battalion Leicestershire Regiment, and was Killed in Action on the 21st of March, 1918, in France. He is commemorated on Pozieres Memorial. The 8th Battalion was formed in 1914 as part of the third phase of Kitchener’s New Army. The date of March 21st was the start of the German Army’s Spring Offensive, when they broke out of their positions, threatening to break through the Allied defences. Many British and Allied soldiers were killed on that day. Military records for David Sadler Hayes have not (yet) been located. He was born in 1897 in Nottingham, married in 1920 to Elizabeth J O’Dell also in Nottingham, and died in 1937 in Nottingham. His military record has not been identified, though it is noted that there are many Medal Index Cards for ‘D Hayes’ few if any of which identify the place of origin.